We used a quantum meter (Apogee MQ-100) and took some fluorescent vs. LED readings. We measured at 5 cm from the light source and took multiple readings of PPFD over the footprint of a typical flat (pictured). All lamps were one year old. The fluorescent fixtures had two 6500 K lamps. Two adjacent 4 ft. fixtures were centered over the flat (pictured). 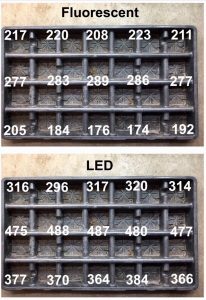 These and many other measurements showed higher PPFD from LED’s.